When intern Kitty Chan is found dead in the basement of the Victoria and Albert Museum, dressed in a Victorian ball gown, the cause of death is quickly established. Kitty died of arsenic poisoning. But who gave her the deadly dose and why? Detective Inspector Helen Shepherd investigates and quickly realises that there is more to this case than meets the eye. Warning : There are some rude words in this story. Buy it at Amazon US, Amazon UK, Amazon Germany, Amazon France, Amazon Netherlands, Amazon Spain, Amazon Italy, Amazon Canada, Amazon Australia, Amazon Brazil, Amazon Japan, Amazon India, Amazon Mexico, Kobo, Barnes & Noble, Apple iTunes, Scribd, Smashwords, Inktera, txtr, Thalia, Weltbild, Hugendubel, Der Club, Libiro, Nook UK, DriveThruFiction, OmniLit/AllRomance e-books, Casa del Libro, Flipkart, e-Sentral, You Heart Books and XinXii. Paris Green is a novelette of 8500 words or approximately 27 print pages. This story is a digital premiere and has never been published previously. Like Old Mommark’s Tale, The Iron Border, Seeing Red, The Cork and the Bottle, Bank Job, Open Season and Overdose, this story was written in response to the eight-hour e-book challenge instigated by Joe Konrath and continued by a bunch of people at KBoards. For more information about the eight hour e-book challenge, see this website run by Donald Rump. Paris Green also marks the sixth appearance of Detective Inspector Helen Shepherd, her assistant Detective Constable Kevin Walker and forensic medical examiner Dr. Rajiv as well as the second appearance of Police Constable Martin Jackson (introduced in A Bullet for Father Christmas) and the third appearance of forensic analyst Charlotte Wong (who also appears in Bank Job and A Bullet for Father Christmas). I decided to use the Victoria and Albert Museum as a setting for Kitty Chan’s dramatic death, because it has one of the biggest and best collections of vintage fashions and Victorian antiques I have ever seen. Coincidentally, they also have a big collection of historical wallpapers. However, unlike in the story, the conservation staff at the real Victoria and Albert Museum (and indeed any modern museum) of the dangers posed by arsenic and other toxic substances in historical artifacts and take extensive measures to protect themselves as well as museum visitors, as this article about the conservation of nineteenth century wallpaper shows. Indeed, I decided to make Kitty an intern at the museum (and a rather careless one at that) precisely because it was unlikely that experienced conservators or curators would accidentally poison themselves with arsenic. The various cases of accidental or deliberate arsenic poisonings such as the Bradford sweets poisoning or the poisoning of Clare Boothe Luce, US ambassador to Italy, that Dr. Rajiv and Charlotte mention are all real incidents. Mary Ann Cotton, Florence Maybrick, Frederick Seddon and Herbert Rowse Armstrong were all real Victorian and Edwardian era murderers who used arsenic to kill and were hanged for their troubles. Another famous arsenic murder case that I would have liked to mention is the but didn’t, because Helen had no way of knowing about this particular case, is that of Gesche Gottfried who hails from my hometown of Bremen and poisoned fifteen people with arsenic laced butter, before she was caught and beheaded for her troubles. Gesche’s story is still well know in Bremen and people still spit on the stone which marks the spot where her severed head landed. I played Gesche in a highschool performance of Bremen Freedom, Rainer Werner Fassbinder’s play based on the case, and her story was one of the inspirations behind Paris Green. Paris Green was also known as Schweinfurt Green, because it was first industrially manufactured in the Bavarian city of Schweinfurt. The grounds of the former Sattler factory, which manufactured Schweinfurt Green as well as several other poisonous pigments, are still dangerously contaminated 200 years after production of the pigment began and 85 years after the factory closed down. Research sources consulted include the books The Arsenic Century by James C. Whorton, Deadly Doses: A Writer’s Guide to Poisons by Serita Deborah Stevens and Anne Klarner and The Elements of Murder: A History of Poison by John Emsley. Researching arsenic poisoning for this story was extremely unpleasant, especially since it tended to cause me to experienced entirely psychosomatic poisoning symptoms. Maison Worth, the makers of the deadly green ballgown, invented haute couture as we know it (and coincidentally introduced the catwalk model to the fashion world). 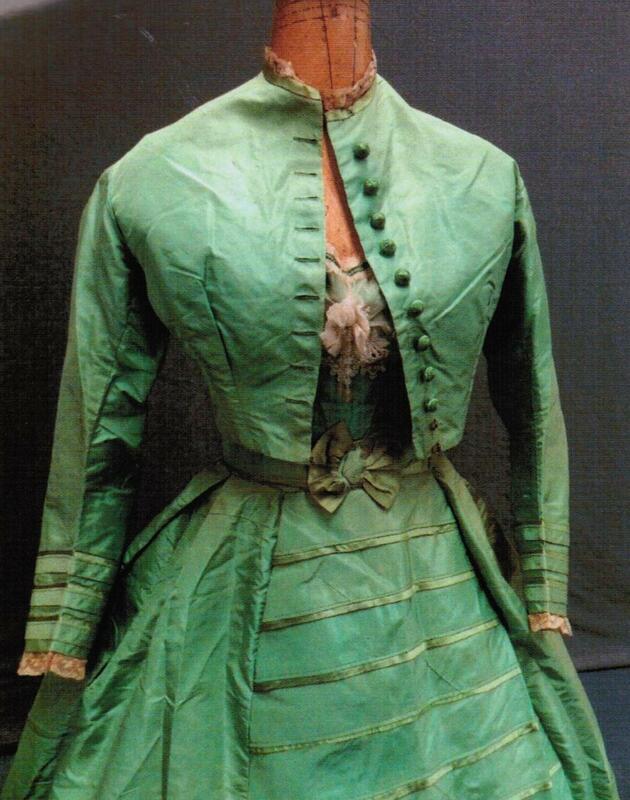 They were also one of the most famous fashion houses of the nineteenth and early twentieth century. 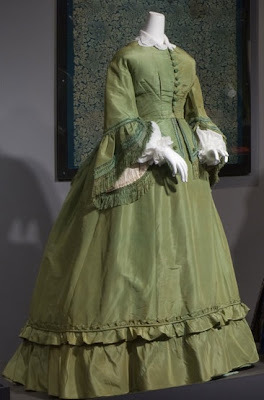 Green gowns were extremely fashionable in the mid 19th century. Here are some examples. The Dancing Groot toy Helen was given in A Bullet for Father Christmas puts in a cameo appearance here. The cover image is a stock photo by Ed Isaacs via Dreamstime.